Supraphon have done Fibich proud with this production. There are two booklets - each in Czech, English, French and German. One booklet, notable for the easily legible size of font used, gives the libretto with side by side translations. The other gives potted bios for Depoltová, Randová, Pribyl and �tych, a quick plot outline, general introduction placing �árka amongst Fibich's other operas and works by Smetana, Janacek and Kovarovic. The two CDs have, in total, 33 tracks so the opera is very easy to navigate and also to pick up if you have temporarily lost your way when following the libretto. It is a minor grouse that Supraphon continue to use the old-fashioned double width case for a 2CD set. They might well think of repackaging this, when it is re-pressed. It would go well as a single-width jewel case plus two booklets in a card slipcase as Timpani have done in the case of Ropartz's opera Le Pays recently reviewed here. �árka is a tragic and cruel Amazonian legend which is part of the Czech mythopoeia. It is gory and daring in the warrior role it accords to women. Its plot continues the story which ended with Libuse, itself the subject of an opera by Smetana (recorded by Supraphon with Depoltová as Krasava). 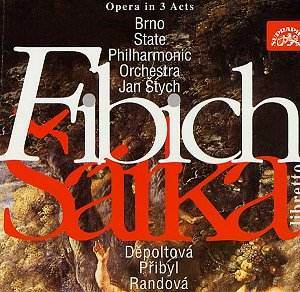 The notes tell us that Fibich's �árka includes a quote from Smetana's Libuse further cementing the sequel nature of the work. Smetana wrote his own �árka as part of the purely orchestral Ma Vlast cycle of tone poems. Janacek's �árka opera was written at about the same time as the Fibich although not premiered until 1925. The plot: The ceremony arranged by Ctirad and Přemysl to honour Princess Libuse (who has recently died) is interrupted by the headstrong ��rka and her female followers. �árka demands the restoration of their rights and when rejected declares war. She lays a trap which is designed to appeal to Ctirad's sense of honour. Ctirad succumbs and rescues her. �árka confesses that it is a trap but Ctirad is captured anyway. �árka defects to Prince Premsyl's forces and leads them on a rescue mission. There is a battle and the women, who are preparing to torture Ctirad to an agonising death, are defeated and slaughtered. Ctirad is saved. �árka torn by the turmoil of conflicting loyalties throws herself from a cliff to her death. This dénouement no doubt reassured audiences of the time with an implicit comment about the place of women and the fate that befalls women who try to break the shibboleths of power and control. The music is typically approachable, nationalist and highly romantic without approaching the much later saturation of Schreker and Zemlinsky. The chorus plays a strong role and there is some gloriously burnished singing especially from the women especially Depoltová and Randová. The orchestra play with furious enthusiasm as in 2.01 (tr 11) and Fibich shows himself a master at the painting of mood and emotion as he did with his unprecedented Hippodamia trilogy of melodramas (also on Supraphon and reviewed here). At the start of Act Two the orchestra raves and flames as if in reflection of the shambles and bloodbath of the women's victories - Radka in track 14 brandishes the severed head of the chieftain of the captured Devin Castle. The music touches many bases - Weber in Euryanthe and Freischütz, Mendelssohn in the Scotch and Italian, Wagner and Bruckner but without their proclivity for longwindedness but injected over and both this is a wild, ungovernable savagery. The break between the first and second discs allows the first track on CD2 to be the nature mystical Vse ticho kolem. In this scene �árka, bound to a tree as bate for Ctirad, muses darkly on her doomed hopes for peace and forgetfulness. Tracks 1-5 represent a gradual and cunningly built love-duet between �árka and Ctirad. Ideas and themes flow in generosity - listen to �árka's tormented eloquence in track 10. The bloody and merciless battle sees the slaughter of the maidens. Their wraiths (visible, Macbeth-like, only to �árka) rise up in accusing clouds destroying �árka's last hopes of ecstatic love with Ctirad who stands by with the slashed and bloody accusers invisible to him. �árka unable to endure it any longer flings herself from a cliff leaving the forlorn Ctirad singing "Alone alone how shall I go on living, alone." Fibich's operas: Bukovin (1871); Blanik (1877) to a libretto by Eliska Krasnohorska, the librettist of Smetana's last three operas; The Bride of Messina (1883); The Tempest - after Shakespeare (1894); Hedy - after Byron (1895); �árka (1897); The Fall of Arkuna (1898). They were all premiered in Prague - the latter posthumously in November 1900. The last three have librettos by Anezka Schulzova for whom he left his second wife. Fibich's first marriage ended with the death of his wife. In 1875 Fibich married his sister-in-law, Betty Hanusova, a singer at the Prague National Theatre. If you have a taste for hyper-romantic 19th century nationalist opera you must have this on your shelves.